I managed to pick up a commission for building a simple Terminator Chaplain. He's a Salamander Chaplain but painting him up is not part of the project. My role was just to build him and at first glance, that seems easy enough but it can be deceptive sometimes. To build a nice, clean model can be harder than it looks. You need to know what to add and what to leave off to convey what you're trying to say. And that goes for just about any conversion for that matter really. 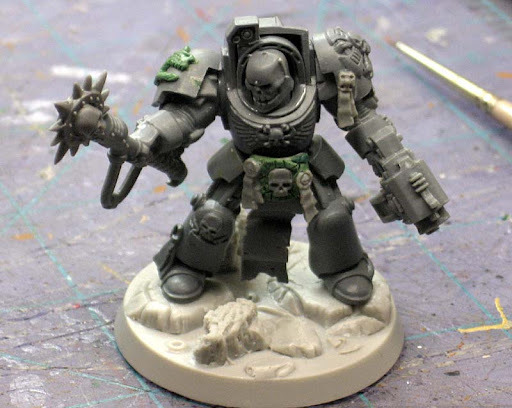 This guy is similar to the metal Terminator Chaplain but made specifically for Salamanders. I wanted him pointing with his crozius in one hand and have his other resting at his side. I was going for a very commanding look to the model. Like he's giving instructions on the battlefield. The storm bolter in the left hand is not something you see often so I wanted to include that in there as well. His crozius is a thunderhammer with an icon in place of the hammer. With it being a skull icon, it helps continue the skull theme with him being a Chaplain. His tabard is the long scroll cut to fit under his belt plate. The plate was given a layer of scales and a couple of purity seals to fill it out. It too has a skull for consistency. 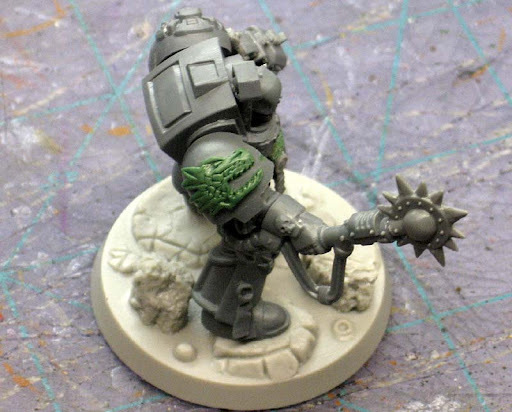 One last set of purity seals on his left shoulder pad help create some diagonal movement through the model and carry your eye across in the direction he's pointing. His left shoulder has a sculpted Salamander Chapter symbol. The base comes from Dark Art Miniatures and is part of the lava base line. The skull head is the classic bit from the Fantasy Chaos warriors. It's a great looking bit and fits perfectly with this model. The turn of the head and lowering it make him look focused. I can imagine him giving a very clear and concise order to a squad of marines during an attack. Is this one you picked up, did your client send it, or was it a custom job you did? looks great gonna make a similair chaplain for my army.... What kind of head are you using?? not sure if it is game legal but you should give him a combi-flamer/melta to go with the Salis theme. Good work I like that helm for a Chaplain. That guy is pure gold. Congratulations - I can't wait to see him painted up. Olberon: The head is from the Fantasy Chaos Warriors boxed set. BigWill: I just build them the way they're ordered. I don't think my clients would be too happy if they ordered one thing and I decided to change it and build them something else. Might make for a short career for me. Badelaire: Hopefully my client will send me some pics of the finished model. I won't be the one painting it up this time but it's always nice to see the end result of your work no matter how much you're involved. As usual I'm in awe of your greenstuff work. Overall effect is fantastic. Thanks Hudson, I'm working on a power armoured Librarian now to go with the same force.